User defined fields are displayed in the above screenshot. To show or hide user defined fields go to File> Preferences> Invoices 2. Type as much of a customer name here as you know and then press Tab. If there is only one name that matches your choice, it will be entered automatically for you, otherwise you will be presented with a list of available choices. Once you have entered a valid name, the New line button will be enabled. If you can not find the name you are looking for, you can add a new name by clicking the person icon ( ) to the left of 'Name'. By default, names with their code starting with a tilde (~) are not shown. This is a great way preventing a user selecting a name when it can't be deleted or hidden in a store - put a tilde character at the beginning of its code. Click on the downward pointing arrow to the right of the Comment field to display a window where any comment relating to this invoice can be noted. If you are using the category feature, and have defined them, the appropriate category is selected from the drop-down list. If you are using the user-defined transaction fields, they will appear and can be filled in here. Should you wish to use them, they have to be activated in Preferences>Invoices 2, refer Show customer transaction fields. Confirm date: The date the invoice was confirmed. “00/00/00” if the invoice has not been confirmed. Note: this date can be made editable from preferences. Invoice: This is the invoice number. The number is automatically incremented and assigned when the invoice is first saved (which actually occurs when the first line is added to it) and is unique within a store. Note that customer invoices in different stores could have the same invoice number. Entry date: The date the invoice was created. Goods received ID: If the customer invoice is linked to a goods received note then its ID will appear here in blue, indicating that it is a link and, if clicked, will open the goods received note. Store: The name of the store the customer invoice belongs to. Will add a line to the invoice. This command can be used on any invoice that is not finalised. Clicking the button will present you with the window for adding a line from stock. See the Adding lines to an invoice section below for more details. To select a line to edit, simply double-click on it. Note that new line and edit line are disabled on finalised invoices. Will delete a line which has been selected, and appears highlighted. Multiple lines, which do not need to be sequential, may also be selected and deleted using this button. This icon is displayed only if `We run a backorder system' is checked in the Preferences > invoices 2 options - refer We run a backorder system. Clicking this button shows you a list of items that are on backorder for the customer you have chosen. To view the backorder list of items, you must first confirm the transaction. Refer to Issuing Goods - Managing Customer backorders for a full coverage of the backorder topic. Clicking on this icon will display a record of all that this customer has purchased in the past. This may produce a very long list! The list appears in chronological order, but clicking on any of the column headers will sort the list according to that parameter. When this button is clicked, the status of the order changes from nw (new) or sg (suggested) to cn (confirmed). If you have “confirm invoices automatically” set in the Preferences, the Confirm button will not be visible. The invoice will be confirmed as soon as you click on the OK button. Read below to see what confirmation does. The confirm button is only available for invoices with status sg (suggested). Confirming an invoice should be done when the goods have been removed from the shelves and have left the store or have been packed ready for dispatch). Most importantly, as far as mSupply is concerned, this stock is no longer in the store and a stocktake will not find it! Each item line records two stock levels- the quantity is the total stock on the premises. the available amount is what can be issued on an invoice. You have 10 bottles of Paediatric Paracetamol Elixir in stock. You get an order for 3 bottles from Fred, and create an invoice for Fred. The quantity in stock is still 10, but quantity available drops to 7, as these 3 bottles are 'reserved' for Fred and can't be issued to anybody else. You are about to dispatch the order. At this point you confirm the order. The quantity in stock also drops to 7. If you are running a backorder system, confirming a Customer Invoices also deletes any placeholder lines (those with a batch entry of “none”) and adds them to that customer's backorder file. Modifications may still be made to the invoice (and those changes therefore directly affect the stock in mSupply). See Confirming an invoice. If you have the store preferences set to force customer invoice authorisation, you will not be able to confirm customer invoices until they have been authorised. See here for details. At the bottom of the Customer invoice window, there are a series of controls. Checking the Hold checkbox prevents the Customer Invoice from being confirmed or finalized. Checking the Finalize checkbox allows you to finalize an invoice when you click the OK button. Only users with Can finalize individual invoices checked in their user permissions can check this box. Other users will be warned if they try to turn it on, and the Finalize checkbox will automatically uncheck. If the Finalize checkbox is checked and you click the Confirm button, the invoice will be confirmed as well as finalised when the OK button is clicked, so be very careful! A finalised invoice may be viewed and/or printed, but it can not be edited. If the Finalize checkbox is checked but dimmed out, it means that File>Preferences>Invoices 2>Finalize customer invoices automatically is checked and all confirmed invoices will be finalised whether you like it or not! The OK & Next button saves the changes you have made and exits the window. You are given the opportunity to print if the Print checkbox is ticked. The Delete button allows the deletion of an invoice. If the invoice has a status of 'nw' you can delete the invoice even if has lines added. If the status is 'cn' or 'sg' you will have to delete the lines manually first - refer Deleting line(s). When an invoice has been deleted the invoice number that it was assigned will be reused. The OK button saves the changes you have made and exits the window. You are given the opportunity to print if the Print checkbox is ticked. If the Print checkbox is ticked then print options will be presented when the OK or OK & Next buttons are clicked. If the invoice status is 'nw' (new) or 'sg' (suggested), pick list options will be printable. If the invoice status is 'cn' (confirmed) or 'fn' (finalized), invoice options will be printable. If the option to turn on the print check box has been set under File>Preferences>OK and print, you can override the printing process by holding down the Shift key as you click OK, and no invoice will be printed. Instead of an invoice, should you wish to print a pick list for an invoice whose status is 'cn' or 'fn', hold down the Alt key (Windows) or the Option key (Mac) while clicking OK. The three tabs allow the invoice to be viewed in three different formats, but note that the lower area of the window remains the same and is available for appropriate input in all views. There are a row of small icon buttons at the bottom left of the window. Hovering the mouse over each button gives a description of what it does. Renumber lines: will re-assign line numbers to all lines on the invoice according to their current order (you can move lines around by dragging and dropping to a new position. Issue stock for all placeholder lines: This option will go through each placeholder line on the invoice and attempt to issue stock. There are several factors that affect the success of the Issue stock for all placeholder lines operation, so you should review the automatic choices mSupply makes to ensure it is appropriate. Pack sizes that fit with the quantity/pack on the placeholder line. mSupply will happily issue parts of a pack. In reality, you may wish to choose from a different stock line with different pack sizes! Clicking this button shows you a summary of the cost and selling price information for the invoice. If you check the Print as Pro-forma invoice checkbox in this window, rather than printing a pick slip, a pro-forma invoice will be printed, allowing you to give a paying client a form showing expected charges. Allows you to make a note relating to this invoice. Copies the entire invoice to the clipboard. The Summary by Item tab displays the items on the invoice, consolidating different batch numbers and displaying the total quantities for each item only; the invoice above appears in the following format when the Summary by Item tab is selected. The Summary by Batch tab displays the items differentiating between batches, and showing a breakdown where more than one batch has been supplied on the order. The above invoice appears in the following format when the Summary by Batch tab is selected; note that two different batches of metronidazole tablets were supplied. Here you can add information about the method of transportation and other related information. You can then report on performance of your transport operations in various ways using the Transport Report. Order written date: The date the customer wrote the order (this will usually be on their requisition form). Expected arrival date: Given the shipping method you're using, when you expect the goods to arrive at the customer's premises. If you use these date fields, it allows reporting using the Transaction Report using the report form Order Processing time. Sometimes it is necessary to edit these dates after finalisation of a customer invoice so there is a special permission for users to allow them to do this (on the User details page, Permissions 2 tab - see Managing users, the Permissions tabs for details. To enter a new method, click the New button. To edit an existing method, double-click the item in the list and edit its details. To delete a method, click on it in the list to select it then click on the Delete button. You will not be able to delete a shipping method if it is being used by a customer invoice. You can print labels from mSupply to stick on each box (either from a label printer or a normal A4 paper printer - see the Printing an invoice: Picking slips and delivery notes section below for details). You can create (automatically or manually) weight and volume information which can be printed on the packing list or passed to your freight handlers. It tells the customer what's in each box to help their goods-inwards processing. For details about how to use this feature, please see Box management. The log tab displays changes to the invoice that have been logged. Details of all logged activities are record in the mSupply Log. If you are using the Moneyworks accounting software then the link between mSupply and Moneyworks will need to be enabled in File>Preferences>Moneyworks - refer General Preferences - Moneyworks. If this option has not been enabled, then the Moneyworks tab will not be visible. The Moneyworks tab will show the status of the invoices inside Moneyworks accounting software once mSupply has carried out an export. The first thing to enter is the Item Name or Item Code in the Item field. Type as much of the Item Name as you know, then press Tab. mSupply searches for all Items whose Name or Code starts with the text you have typed. By default Items with a Code starting with a tilde (~) are not shown. This is a great way preventing a user selecting an item that shouldn't be used when it can't be deleted or hidden in a store - put a tilde character at the beginning of its code. If no entries match the request, the Item field will read 'try again'. You can try as many times as you like! If you conclude that the Item you want does not exist in your system, click New item to add the Item. Caution should be exercised before adding a new Item to your mSupply system. Duplicate items cause problems. Ensure that the item you are looking for does not already exist in your system and is hidden in the store you are logged into or is under a different Item Name and Item Code. If only one Item matches your request, it will be chosen automatically and you will be returned to the Add item… window with that Item already selected. If your mSupply system has been set up with unique Item Codes for each Item, then the experienced user will find that typing in the full Item Code here will save mouse clicks and/or key presses. If more than one Item matches your request, all of them will be displayed. If the wanted Item is visible, double-click on it or click on it once and then click Use. If the wanted Item is not visible, click Cancel to try again to find it. Once the item you want has been selected, the Add item… window will display a list of available Item Lines (if any). Each Item Line may be a different pack size, batch, expiry, or price. The Item Lines are sorted by expiry date; first expiry at the top. Type the line number into the Line field and press Tab. The cursor moves to the Quan field. Double-click on the line in the list. That line number is displayed in the Line field and the cursor moves to the Quan field. Single-click on the line in the list. Clicking again in the Issue column will allow you to directly edit the issue amount in the list - see following. Once you have chosen your line, the number of packs available will be shown to the right of the Quan field, the Pack size will be shown in the Pack field, and the total quantity to be issued will be shown below the list of lines. In the Quan field, you can enter any number greater than zero. If you need to see the full details of the item itself, click on the down arrow icon ( ) to the right of the item name field and you will be taken to the item's details window. The number entered in the Quan field is the number of packs. The pack size of the currently selected line will be used to calculate the total quantity of units issued - which is shown below the list of lines as Total quantity issued. If the number entered in the Quan field is less than or equal to the number available for the selected line, then that value will be shown in the Issue column in the list. Click OK to return to the main invoice screen, or OK & Next to add another Item. If the amount to be issued is greater than what the top line can issue, then you can issue from multiple lines without leaving the window. There is an automatic and a manual way of doing this. The Tab / Shift-Tab keys move the focus up and down the Issue column. The Total quantity issued is updated at the bottom of the Add Item… window. If the amount to be issued is greater than what the top line can issue, mSupply can automatically select stock from multiple lines on a FEFO basis. To allow mSupply to do this, simply enter the total quantity you wish to issue into the Quan field. If you accidentally entered more than you intended, click Try again, otherwise click the Distribute button. If the amount to be issued is greater than the total stock available from all of the available lines, then a placeholder line may be used, if your mSupply preferences allow. If there are no lines available, or none of the lines are suitable (for example, this order needed strip packaged stock, and the available lines are all bulk packs), then you can add a placeholder line that will record the desired quantity and pack size until either you get stock, or go to confirm the order, at which time the item will be either moved to backorder or deleted (depending on how you have set your Preferences). A Placeholder line can be added manually or automatically. A Placeholder line can be added by clicking the Add Place holder button. As shown in the window displayed below, placeholder lines are coloured in red and have a batch of “none” so you can easily identify them. After clicking OK, all existing stock lines will have the Issue column populated with the total quantity available for each line, and a placeholder line will be created with the outstanding quantity inserted in the Issue column. If you have allowed placeholder lines in the Preferences, and you choose an item that has no available stock, a placeholder line will be created automatically. If you have activated backorders, a backorder line will be created for each placeholder line. If you have set the Preferences to delete placeholder lines when confirming, they will be deleted, otherwise they will remain on the invoice to show the client that their order was received, but the goods were not supplied. Sometimes you might end up with an unusual available amount of a particular batch. Due to the fact that mSupply rounds the available quantity, it may be hard to enter the exact amount to completely issue the batch. In such situations you can issue the total amount available by holding down the shift key while you double-click a line. This will issue the total available amount of that batch. Sometimes you will see that a stock line has a tick in the tick-box in the Hold column and the line cannot be selected for issue - see example below. The stock line is On Hold - refer Issuing goods to a customer (customer invoices), Adding lines to an invoice, Selecting from Item Lines, Lines on Hold. The location is On Hold - refer Locations and location types, Adding a location, General tab. You can find out whether it is the stock line or location (or both!) that is On Hold by double clicking on the line in question. If there is insufficient stock in 'off-hold' stock lines to fulfill the invoice, a placeholder line will be created. When you click this button it shows you a list of all the Bills of Material that exist in mSupply. Select one of those then mSupply will add all the items on that bill of materials (with the quantities they have on the bill of materials) onto the customer invoice as placeholder lines. You can then assign stock to the placeholder lines in the normal way (see, for example, Editing a placeholder line on an invoice below). See the Bill of materials section for details about creating and using bills of material. To edit an invoice line, double-click on it. You will be presented with the Edit line window, which is identical to the New line… window, except that the item name is already chosen. 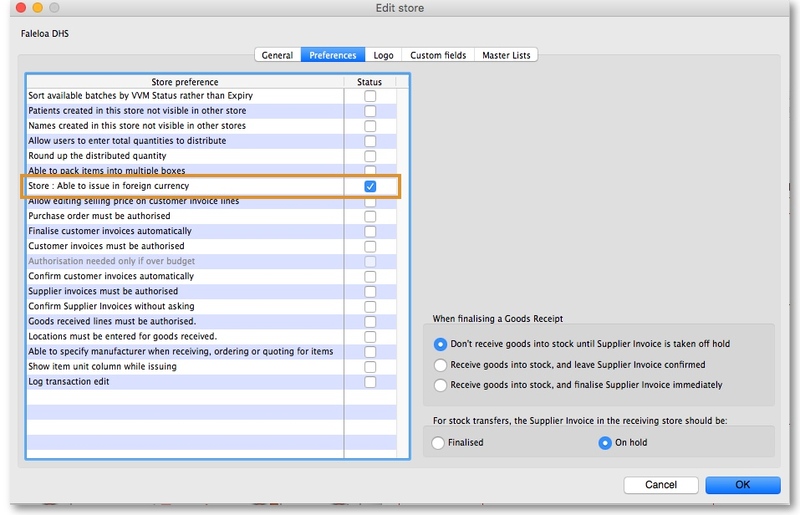 In the Edit line window the quantity you have already chosen is added back into the Available stock column. You are viewing the stock records as if the line has not yet been processed. Similarly, any other invoice lines for the same item are also shown in the same way; the Issue column is filled out with the the amount being issued from each batch on the invoice and the Available column includes the Issue amount. For example, in the window below, there are three lines on the invoice for different batches of paracetamol, and all three are shown when editing, irrespective of which of the three lines was double-clicked. Select a different item line (that is, a different batch) and edit it's Quan or Issue value. Click in the item name field, and select an entirely different item! If you proceed to issue the new item, all invoice lines for item you were editing will be deleted, and invoice lines will be added for batches being issued of the new item. If you choose a new item for which there is already an invoice line(s) on the invoice, the stock to be issued on those lines will be shown in the “issue” column. If you proceed you are effectively editing the quantities of the item you have just selected, and you are deleting all invoices lines of the item that was originally on the invoice. double-click the batch you do want, and enter the quantity you want to issue. Note that if possible the new batch will be added to the invoice at the bottom of the other lines, and the former invoice line will be deleted. You can use drag and drop to reorder invoice lines if this is a problem. The Redistribute all button takes the quantity on placeholder lines and re-assigns it to actual batches in stock. When you are not editing a placeholder line, the button is not visible. If the line is a placeholder line, you can simply click the line you wish to delete, then click the delete line button. If the line is a normal invoice line (with stock associated with it), double-click on the invoice line. In the line details window that appears, press Tab to advance to the quantity field, enter 0 (zero), then click OK. You will be asked to confirm that you really want to delete the line. Note : Once an invoice that has been finalised, you can not remove an item from it. Invoice lines can also be reordered by drag-and-drop of a line to a new location. This can be useful to group lines for the same item. If the invoice lines are currently sorted by line number the renumbering will happen, otherwise you will be shown an alert message. If you really want to reorder lines when sorted by a different column, hold down the shift key as you drag-and-drop to override the message. Note that reordering can not be undone, apart from you manually dragging lines back to their original location. Lines in most mSupply forms can be sorted according to any column by clicking on the heading of the column that you want to sort by. To make any sort order 'stick' when it is printed, you will need to renumber the lines - refer Issuing Goods to a Customer (Customer Invoices), The Grinder button above. A common desired sort order for a pick slip is to sort lines by Location, so that when a pick slip is printed, the picker can work their way through the store systematically by Location. In fact, this is such a popular feature, we have set a printing preference so that it will happen automatically without needing to manually sort the list - refer Printing Preferences . If you have customers that use a currency other than your own, mSupply can be configured to use your customer's own currency. Firstly you need to make a selection in the Store's preferences to enable issuing in a foreign currency. Once you have done this, you can select a currency for a customer from the edit customer window. 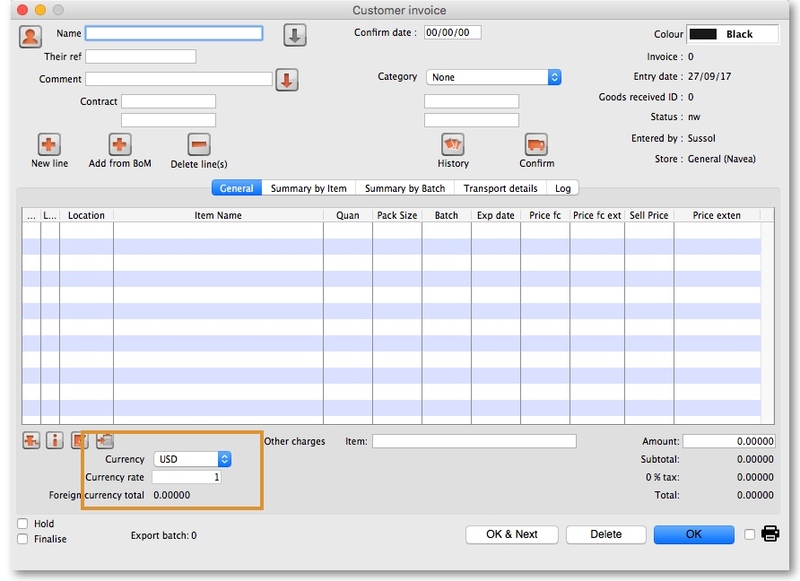 You can also select the customer's currency when entering an invoice. Currency: This is the currency your customer uses. It is set in the Customer Details window of the Customer record and is displayed when you add your customer's name to the invoice. Currency rate: Gives the exchange rate stored in mSupply. Foreign currency total: Provides the invoice total in the currency the customer uses. If the invoice is suggested (sg) then a picking slip is printed. If the invoice is confirmed (cn) or finalised (fn) then a customer invoice or delivery note is printed. The Form to use drop down list contains all the options for the format of the print out you will get. All the standard mSupply options will be here, as well as any custom forms we have created for you. If the form you selected to use wasn't the one offered by default and you want to set it to be the default from now on (beware, this will set it for everyone!) then check the Remember this choice checkbox before you click on the OK button. If you want to print dispatch labels to go on each box then check the Print dispatch labels checkbox. This will print labels on 100x150mm labels on a label printer, not the usual A4 paper printer you print the picking slips and delivery notes with so you must have configured that in mSupply first - see Printing preferences (setup) for details on how to do this. If you only want to print the dispatch labels and not a delivery note then select the None option in the Form to use drop down list. Printer: the invoice will be printed out straight away. Preview: a preview of what the invoice will look like when it is printed will be displayed in your installed PDF file reader. You might be able to print the invoice from the PDF reader, depending on its features. PDF file on disk: the invoice will be saved to disk in PDF format. Email PDF: the invoice will be created as a PDF file and attached to an email for you to send. You can double-click the email attachment to see a preview of the invoice. The email preferences in File > Preferences should be setup correctly before using this feature. Export to Excel: the invoice will be exported as a spreadsheet file and opened for you (provided you have a spreadsheet application installed). Create the customer invoice (new or suggested status). Print the picking slip and give it to the staff who will pick the goods off the shelves. As the goods are picked, note down any discrepancies between what was actually picked and what was on the picking slip. When the pick is complete, enter any changes into the customer invoice in mSupply (Note that inventory adjustments or location adjustments of stock may be needed to correct issues found by the pickers). This step is very important to make sure your stock remains accurate in mSupply. Confirm the customer invoice when it matches exactly what was picked. Print the invoice again - this time a delivery note is printed. Send off your goods with the delivery note! You can print picking slips by item name in alphabetical order (the default) or, if this does not match the way goods are stored in your warehouse, you can change the order to make the top-to-bottom picking order more efficient. Use location priority (see Locations and location types) and the printing preferences (see Printing preferences) to achieve almost any order you want to match the most efficient way of picking in your warehouse. All “normal” customer invoice lines represent the issue of stock lines to a customer. (These lines appear in the large section in the middle of the “Customer invoice” window). mSupply also allows you to charge a customer for “service” item(s) such as freight, or advice or a refundable deposit on a cool box. Enter the description and amount at any time until the invoice is finalised. Note: the “subtotal” amount on the invoice includes any service charges, and tax (if any) will be added to the amount you enter. The tax rate on an invoice is determined by the “default tax rate” setting in the mSupply Preferences. To edit the tax rate on an invoice, click on the tax rate box at the bottom of the invoice entry window. You will be asked to enter a new percentage tax rate. Click the cancel button if you do not want to change the tax rate. Note: you can not change the tax rate on finalised invoices. 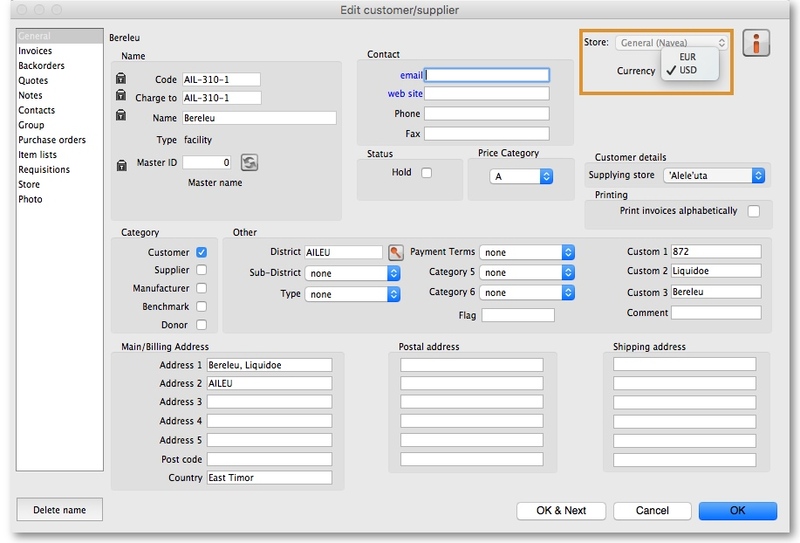 Choosing this command from the Customer menu allows you to take a supplier invoice and directly make a customer invoice. It is useful for goods that are delivered directly from a supplier to a client, but are charged through your organisation. You will be asked to enter the supplier invoice number and the customer code for the invoice to be created, so have this information ready. When finished, a customer invoice with suggested status is created. If any lines from the supplier invoice have been issued already, you will be alerted and only the available balance will be added to the customer invoice.